Celebrate Black Cat Appreciation Day on August 17! 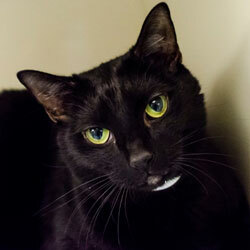 At the ASPCA, we LOVE black kitties—but the sad truth is that not everyone feels the same way. Due to outdated (and incorrect) myths and superstitions, black cats have a really hard time getting adopted. That’s why we were so glad to learn that this Sunday, August 17, is Black Cat Appreciation Day! Black cats are just as loving, sweet and wonderful as any other cat! Salem can be a bit shy with new people, but once he gets to know you, he’ll shower you with purrs, head-butts, and plenty of lap time. 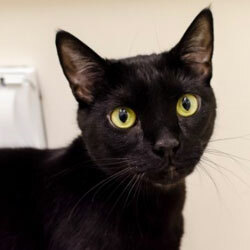 If properly introduced, this handsome 2-year-old can live in a home with another cat. 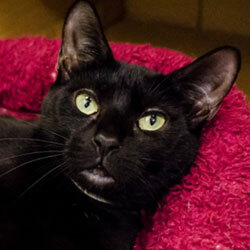 This sweet, soulful 4-year-old cat is ready for his forever home. He’s a bit nervous around other cats, so Pinky would do best in a home where he gets to be the only pet. He also has a soft spot for yummy treats! Princess is a sensitive kitty and can be timid around new people. Once she relaxes, though, she is very sweet and enjoys petting. She will do best in a home with an experienced cat adopter and respectful kids ages 14 and up. James (4) and Gwendolyn (6) are another bonded pair. These sweeties like attention, but they also appreciate their solitude from time to time. 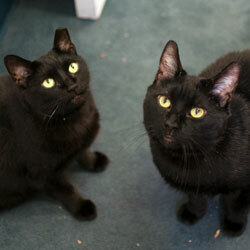 Both are FIV positive and would do best in a stable home with an experienced adopter. 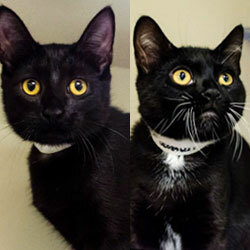 Bernard and Minerva are BFFs (Best Feline Friends), so they are looking for a home together. These four-month-old kitties would do best in a quiet home with respectful kids ages 12 and up. 8.18.14 Update: Bernard and Minerva were adopted!